Reusing and repurposing things you already have around your home is a great way to save money and make the more environmental friendly choice. And there are so many items around your house that can be recycled and made new again with a little creative thinking! If your Cook shed is primarily used to store all your plants, gardening supplies and equipment than here are some creative Pinterest inspired ideas to give you more storage room for little to no cost. And check out Cook’s Pinterest page for more great home and garden tips! A Cook building is the answer to any storage need and our garden shed option is the perfect fit for anyone with a green thumb! It comes in 3 sizes and the package price includes a window, shutters and a flower box! Learn more about our garden shed here! Here are 9 ideas to help you get creative in your garden shed that will have you counting down the days to planting season! Trust us these will be more fun than just buying a bunch of big storage containers. Hold onto all those empty jars from food containers and beauty products; clean them out and use them for anything and everything. You can plant flowers or herbs in them, use for vases or store seed packets and other small gardening tools. Place them on a tabletop or screw into a rustic piece of wood and hang on your wall to create even more space! Make rustic looking shelving with used wood or crates by just screwing pieces together. Crates or boxes are the easiest way to create a multi-tiered solution but for the more handy folks, any scrap wood pieces can be made into simple shelves. Remember to drill pilot holes into the corners so the wood won’t split. Read this post for more great tips on DIY shelf options! Paint or reuse an old bucket as the place for your garden forks and spades. Instead of putting those important hand tools in a drawer, add them to the bucket along with sand and a little oil. Then, when you need one, you know right where it is! Make old tires new with a quick coat of spray paint. Stack two to three tires, screw in wheels to the bottom and you have a mobile tool station. Use an old toilet paper holder to keep string or twine untangled and ready to use when you need it! Pallets can be found just about everything and converted to just about anything. 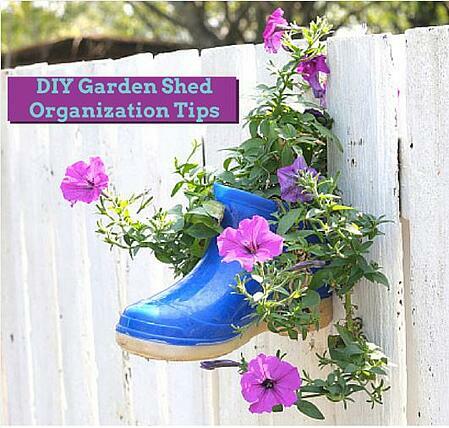 But keep it simple with a coat of paint and addition of hooks to hang gardening tools, hanging pots and hoses. Use some of that ribbon you have left over from the holidays and clothespins to keep track of your gardening chores or planting needs by month. Clean up empty paint cans and use to hold grass seed or bird seed to fill your bird feeders. Add a cute label or scrapbook paper to the outside for an extra touch. For a bonus gardening tip- be creative with what you turn into a planter, it doesn’t always have to be in a gardening pot. Some ideas include old water cans, rusted funnels, colanders or other thrift store kitchen finds and those things like a wagon or rain boots that you kids have outgrown. With a new coat of paint you will be impressed at the difference in these ordinary items! If all these great ideas have got you thinking about investing in a place to store all your gardening stuff, a Cook Garden Shed could be the answer for you! 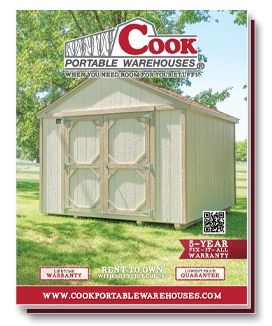 Download our Free Fitting Guide below to see which Cook Portable Warehouse is the right fit for your family!